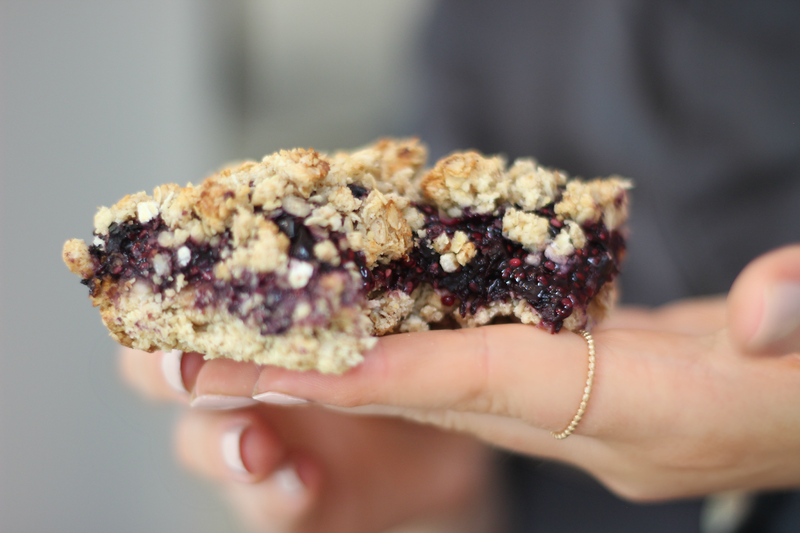 A crumble-top cakey-bake with a oat biscuit-base and a Blueberry Chia Jam sandwiched in between. Makes for a great breakfast slice, as a snack or as a dessert with a scoop of vegan ice-cream or drenched in custard. Make the Blueberry Chia Jam by placing the defrosted blueberries in a bowl, along with the chia seeds, maple syrup and lemon juice. Mash with a potato masher and ensure it is mixed well then put to the side to thicken for around 10 minutes. Pre-heat the oven to 180 degrees celsius, then prepare the Breakfast Oatie base by adding all of the dry ingredients into a bowl. Turn them over with a spatula, then add in the wet ingredients one-by-one. Stir with the spatula until the mixture has formed, it should be quite crumbly but it should stick together at the same time. Take 3/4 of the mixture and press it evenly into a baking dish or tray (if using a tin, line with parchment paper) using a spatula. Place that in the oven to bake for 10 minutes. Remove it from the oven and spread the Blueberry Chia Jam evenly on top of the baked base, then take the remaining 1/4 of the Oatie mixture and crumble it over the top of the jam, then place it back in the oven to bake for a further 20 minutes. Once it's done, remove it and leave it to cool before serving, alternatively, then place it in the fridge to firm up further.